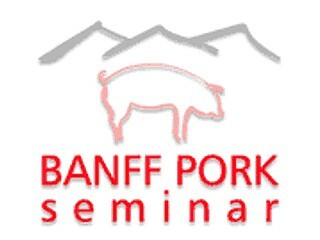 Just before the 'boar pit' session kicked off at Banff Pork Seminar 2014 a bombshell had dropped - news of the first case of deadly pig virus "PED" confirmed in Canada. Understandably this topic dominated the session, which is designed as an open-format, no-hold-barred, frank and interactive discussion of the hot issues in pork production. 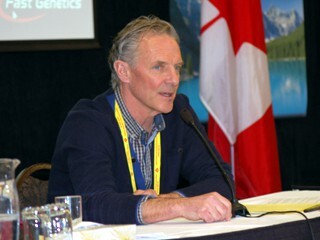 Leading the session were three panelists, including producer Claude Vielfaure , Dr. Doug MacDougald of SouthWest Ontario Veterinary Services and economist Steve Meyer of Paragon Economics, along with moderator Shannon Meyers of Fast Genetics. Porcine epidemic diarrhea (PED) has become a major problem for the U.S. pork industry recently. Dr. Doug MacDougald has been at the forefront of Canada's effort to understand and rally support for precautions to limit PED risk. He provided an update based on the day's news. "There's a 500 sow farrow-to-finish operation confirmed positive as of today," says MacDougald. "It's a closed herd. At this point there is no short-list of probable introductions of the virus. The direction today is containment. The direction is also to follow contacts on where people, supplies and equipment have gone. As of today and tomorrow the focus is marshalling resources and doing extensive investigating. We will know 30 hours from now on at least the initial contacts to this farm if it has spread by those means or not." There is no need to raise panic, he says. "There are a lot of misconceptions on the manner and speed of how this has spread in U.S. It may be acting like a supervirus, but folks it's not. It's a coronavirus, there's good history and knowledge, and we know if it's handled right in most situations, the track record is sow herds can eliminate this in 90 to 100 days." "The most important thing in a case like we've found today is put your arms around and contain it. That's what's happening now." More cases are likely and the industry is expected to enter a lock-down mentality to limit spread. Several participants noted the risk has been very high given the close interaction between the Canadian and U.S. industries, so while the news is not welcome it is also not surprising. The tone in the room reflected a resolve to make good decisions and work diligently to turn a challenging situation into a speed bump that will not derail a Canadian pork sector that has been looking very strong. The boar pit blocked time to make sure other topics could be discussed and one of these was the generally encouraging indications of what the future holds for the prospects of pork producers and their industry. Despite the news on PED, the overall outlook for Canadian pork production is very positive, says Steve Meyer of Paragon Economics. "In fact it's excellent, particularly for the next two years." "It's a very good outlook in terms of reduced costs and profitability," he says. "We're looking at profits of $25 per head for most operations and up to $40 per head from some of the top ones." He noted he doesn't see any further inroad of PED in Canada affecting price in a negative way. Also discussed was how Canada is closing in on a major milestone to complete a new Code of Practice for the care and handling of pigs. There has been a lot of debate around this particularly on the issue of sow housing. Consensus has been reached on the new Code but details will not be officially released until it is finalized in a couple months, likely in March. Producer Claude Vielfaure has been involved in the Code development process and was asked "In your mind what's real in this new Code that will affect producers when it hits the ground?" "Four things were probably the most contentious around the Code development table," says Vielfaure. "Group housing. Space requirement for nursery and finishing. Euthanasia and enrichment. These were by far the hottest topics negotiated." On sow housing the clause in the draft Code has changed significantly based on producer and industry response during a Public Comment Period. "I think with this change the result reached will keep our industry competitive and hopefully most producers will be comfortable with it." U.S. based Steve Meyer was asked his opinion. "We approach this differently in the U.S. The short answer is we see the Code approach as 'Canada's PED,'" he quipped, "We'd like it to stay on your side of the border."